Matt dragged in these flat files shortly after we moved into this apartment. A friend’s dad was getting rid of them, and Matt immediately asked if he could have them, smitten as he was with the weight and color of the wood, not to mention the idea of having awesome old flat files from the 50’s in our place. His original intention was to use it to store his artwork, but it didn’t quite pan out that way. He soon found an better system of flat files, metal ones they were throwing away at work which are larger and more efficient, and that’s what he actually uses for his artwork. He keeps them in the basement with his worktables and paint and whatnot. 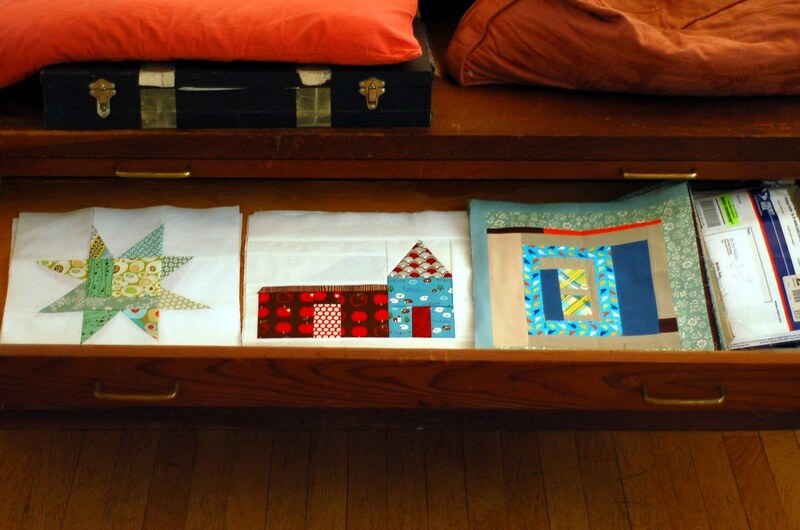 Eventually, I started to use the files up here because they seemed like the perfect place to store my quilty works in progress. Now, it’s filled with my different blocks for different projects, a couple of hand-quilting projects in the works, and finished doll quilts. I think it’s time to officially call it my quilting files. With the backs of a couple of drawers falling off and wide enough openings above each drawer for an array of pet hair and the occasional dust bunny to fall through, it’s not a perfect system, but like Stuart Smalley, it’s good enough, smart enough, and doggoneit, I like it – a lot, actually.